When Hilde was here for Mother’s Day, we took a drive that included Jackson’s Mill. There is a small Jackson graveyard on the grounds, very close to the highway. 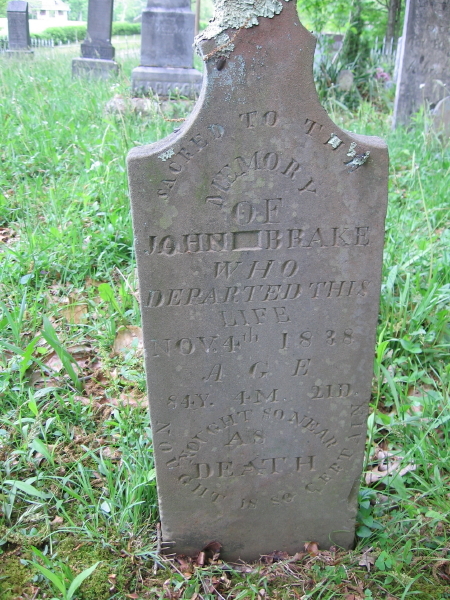 I hadn’t been interested until I discovered that my 4th great-grandfather, John Brake, was buried there. Elizabeth Brake, his daughter by his first wife, married Edward Jackson, and had her father buried in the Jackson plot, separating him from his second wife, my 4th great-grandmother, Catherine Shook Brake, who is buried in the Morrison Cemetery at Berlin with two of her daughter’s families. They were separated, but he has a matching stone. The style and the wording “Sacred to the Memory” are the same. He didn’t live long past her death; she died in February and he in November of 1834. John’s mother, Maria Elisabeth Kieffer, was one of my many ancestors killed by Indians during the settlement of West Virginia. She died on the South Branch of the Potomac in an Indian raid about 1764, and John’s brother Jacob was a captive for more than ten years. John’s first wife, Elizabeth Wetherholt, was the daughter of Capt. Nicholas Wetherholt of Northampton County, Pennsylvania. His brother, Jacob, also a militia captain, was killed in an Indian raid in 1763. Jacob’s widow, Susanna, married Michael Kern, one of the founders of Morgantown, who had Kern’s Fort, which was in what is now South Park in Morgantown. Don't ask yourself what the world needs. Ask yourself what makes you come alive and then go do that. Because what the world needs is people who have come alive. - Howard Thurman. Winds are South at 9.2 MPH (8 KT). The pressure is 1015.6 mb and the humidity is 45%. Last Updated on Apr 23 2019, 9:53 am EDT. Love getting bits of your family history, and the history of the region, this way, Lisa. This helps me to imagine this land 240 years ago, and think about the brave and desperate people who came here to live. Glad to see that some of the family is keeping up with the history. I’ve been researching more on the Reger/Brake side. Got to keep it passed on. John Brake is also my 4th ggfather. I’ve been working on genealogy for years, but have been delving into this side more recently.